Formulated for in-flight support during skywards travel, Organic Jetset keeps your skin deeply hydrated and nourished while our blend of native botanicals and pure essential oils help promote a relaxed sense of wellness. dry skin: apply to arms, hands, elbows, ends of hair, face, decolletage and other dry spots prior to taking off, and regularly during your flight to maintain moisture and ease dryness caused by air-conditioned air. 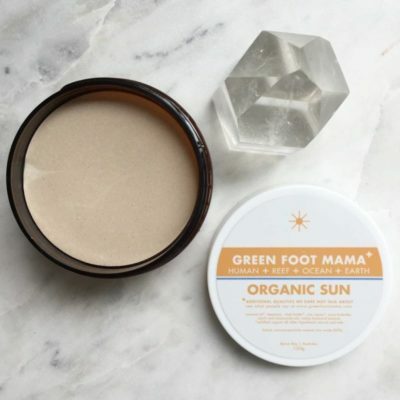 Forms a protective barrier for the skin. lower legs and feet: warm balm in your hands and massage lower legs and feet in circular movements. Elevate feet if swelling begins, and remember to take small walks at regular intervals. 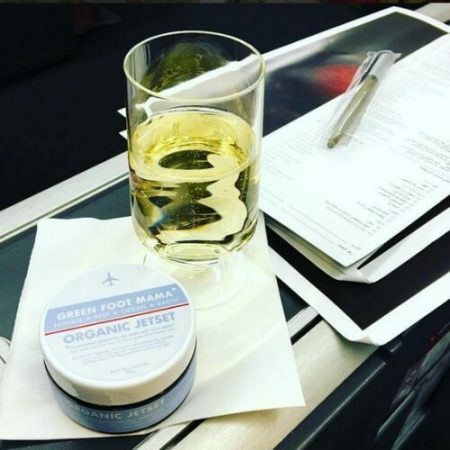 travel stress or anxiety: begin massaging into hands, feet, legs, wrists and temples a few days prior to take off and again one hour prior to boarding. 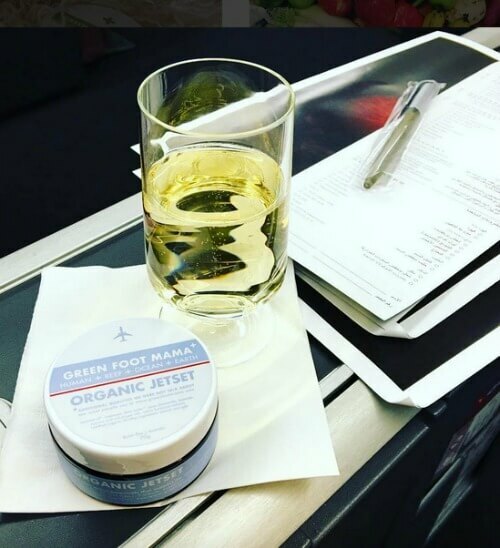 The wrists and temples are key points to apply Organic Jetset throughout your flight and stopovers for additional support. freshen up prior to arrival: head to restroom and place a warm (hot as you can stand it) damp cloth on your face to begin process. 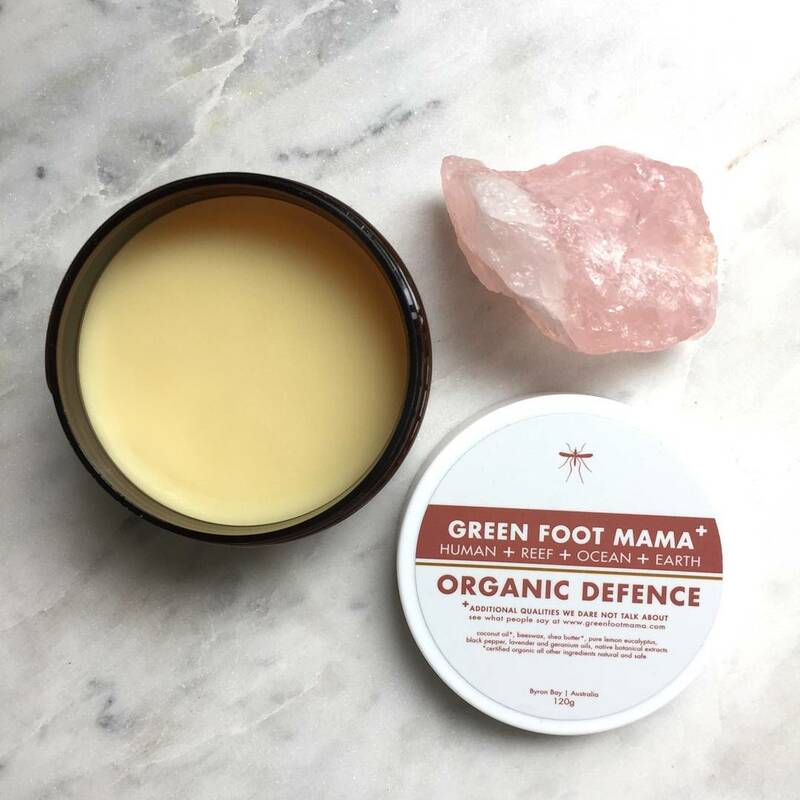 Warm balm in your hands and massage your face in deep circular motions. Start at forehead and work down, then run your fingers firmly along your jawline, outwards from chin to ears to stimulate lymphatic flow. Continue massaging down to your decolletage. Apply hot cloth again to face and decolletage, leaving to rest for 30 seconds, allowing you to feel rested and energised. Wipe areas clean and splash with cold water to tone and finish. mask unpleasant odours: this is never nice in a confined space! Use a small amount under and around your nose to mask the smell and distract your senses. pure essential oils of Lavendula angustifolia (lavender), Chamaemelum nobile (chamomile), Zingiber officinale rhizome (red ginger) and native botanical + vibrational extracts. 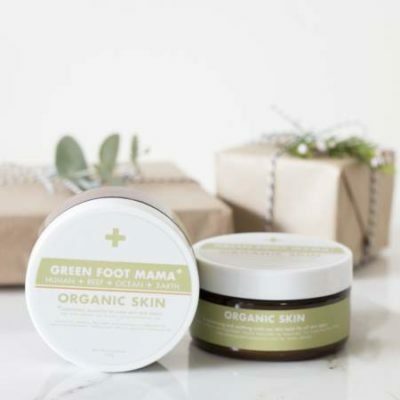 Green Foot Mama holistic moisturising balms are made from natural ingredients to nourish and protect your skin. Caring for you, your family and the planet. Naturally. 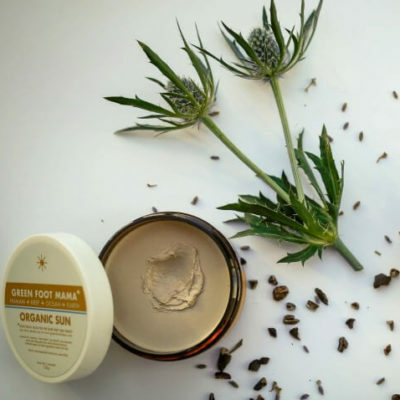 We use Chamomile to moisturise, soothe and condition your skin and help repair damage. We use Lavender for its calming and soothing scent and ability to help ease tension. We use Red Ginger to promote circulation and help ease any nausea associated with motion sickness. 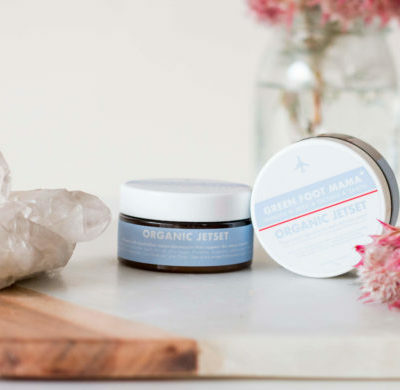 dry skin: apply to arms, hands, elbows, ends of hair, face, decolletage and other dry spots prior to taking off, and regularly during your flight to maintain moisture and alleviate dryness caused by processed air-conditioned air. 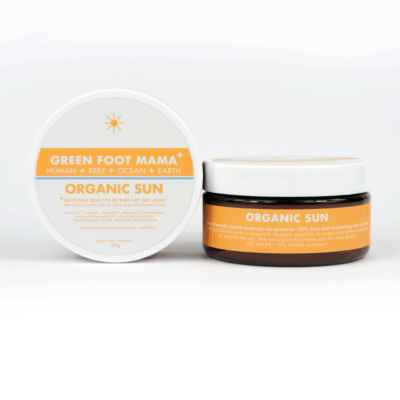 Forms a protective barrier for the skin. 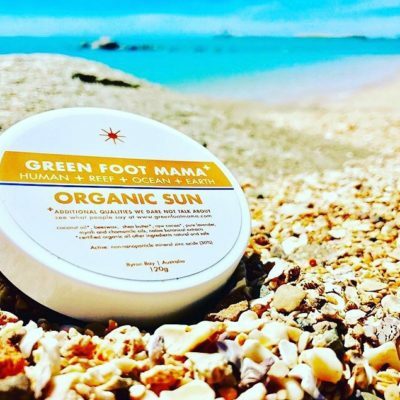 lower legs and feet: warm Organic Jetset in hands and then massage lower legs and feet in circular movements. Remember to elevate feet if swelling begins, and take small walks at regular intervals. feelings towards your skyward journey: begin massaging into hands, feet, legs, wrists and temples a few days prior to take off. Then again one hour prior to boarding. 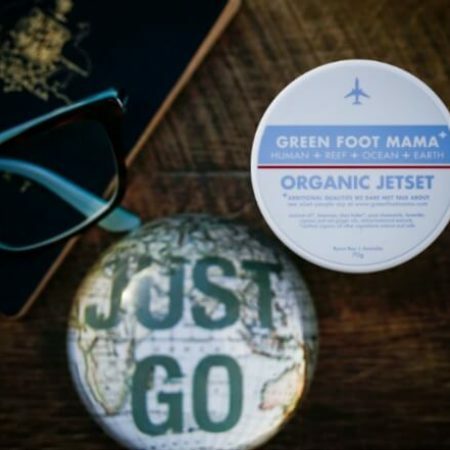 The wrists and temples are key points to apply Organic Jetset throughout your flight and stopovers for additional support. a quick freshen up prior to landing: head to restroom and place a warm (hot as you can stand it) damp cloth on your face to begin process. 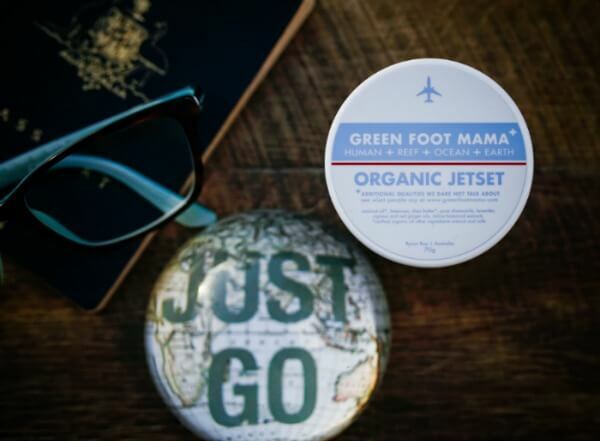 Warm a small amount of Organic Jetset in hands and begin massaging the face in deep circular motions. 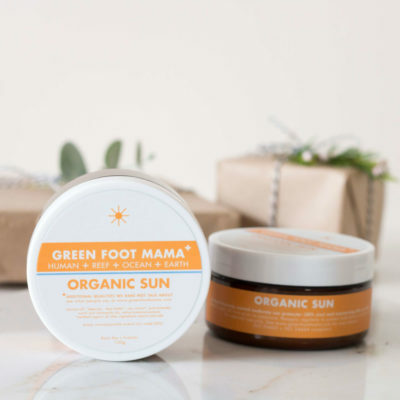 Start at forehead and work down, then running fingers firmly but gently along jawline, outwards from chin to ears to stimulate lymphatic flow. Continue massaging down to decolletage. Apply hot cloth again to face and decolletage, leaving to rest for 30 seconds, allowing you to feel rested and energised. Wipe areas clean and splash with cold water to tone and finish. unpleasant odours: this is never nice!! whenever this occurs, pop a small amount under and around the nose to deflect and distract your senses from the awfulness until it passes. Releases stress and worries, promotes courage to face the journey. Aids rest, drawing upon our inner strength to fuel the endurance required. Allows us to surrender to the process, embracing our own personal space and safety. Transforms disorientation, leaving us feeling refreshed and centred. 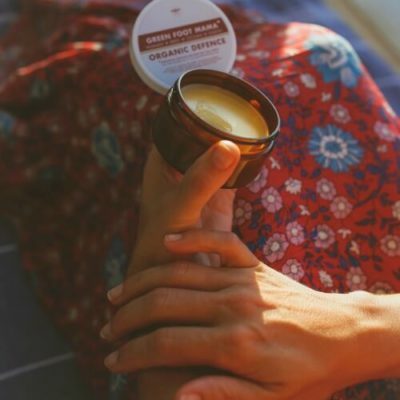 Cocos nucifera (coconut) oil*, natural Cera alba (beeswax), Vitellaria paradoxa (shea butter)*, pure essential oils of Lavendula angustifolia (lavender), Chamaemelum nobile (chamomile), Zingiber officinale rhizome (red ginger) and native botanical + vibrational extracts. 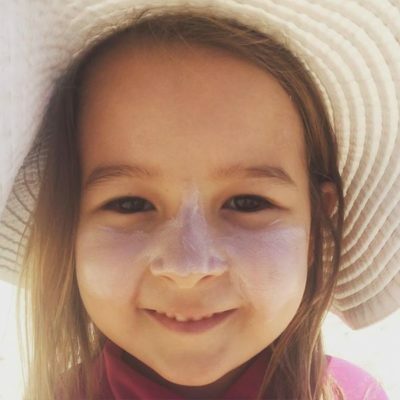 “I have extremely sensitive skin and have spent thousands of dollars on skin products over the years that I have had to give away because I end up with a rash. 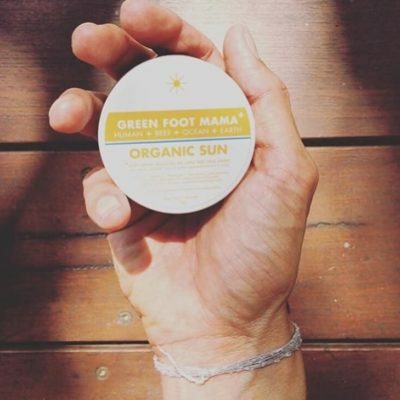 I have tried products claiming to be suitable for sensitive skin, organic products and most of the expensive brand name products with not much luck. 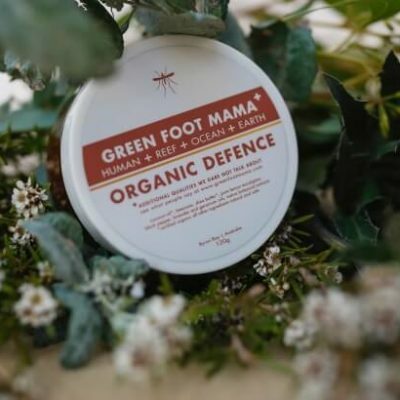 So when I tried the product I was expecting that instant stinging sensation I feel on my face when I try almost every product… it never came so myself and my family continued to use it for the remainder of the 24hr journey and we were extremely happy with it. We ended our Europe trip in cold and windy Holland so you can imagine our lips and skin were pretty dry. We also had a ridiculously long stop over in China so our journey home was significantly longer than the way there and starting with such dry skin and lips so the Jetset product had some serious work to do. – Emmi Jupp via email. “I’m 6.4 ft and every time I have to get on a plane is pretty much a nightmare, not being able to fit in those short and narrow seats the whole experience just feels stressful. 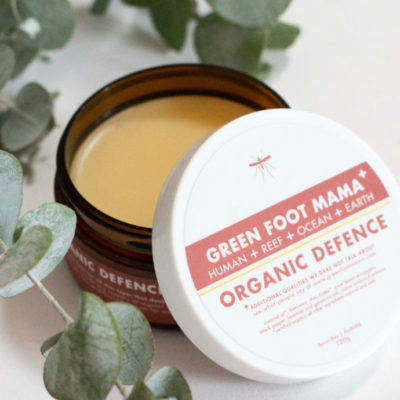 I’m not saying this balm made my legs shorter but on my recent trip to Europe I’ve used it and somehow it managed to ease the journey under several aspects. I didn’t experience dry lips and skin after all those hours with ridiculously strong air-conditioning, I generally felt more relaxed during the travel which means less fatigue at the end of the trip resulting in way less jet-lag to deal with!! What else can I say? 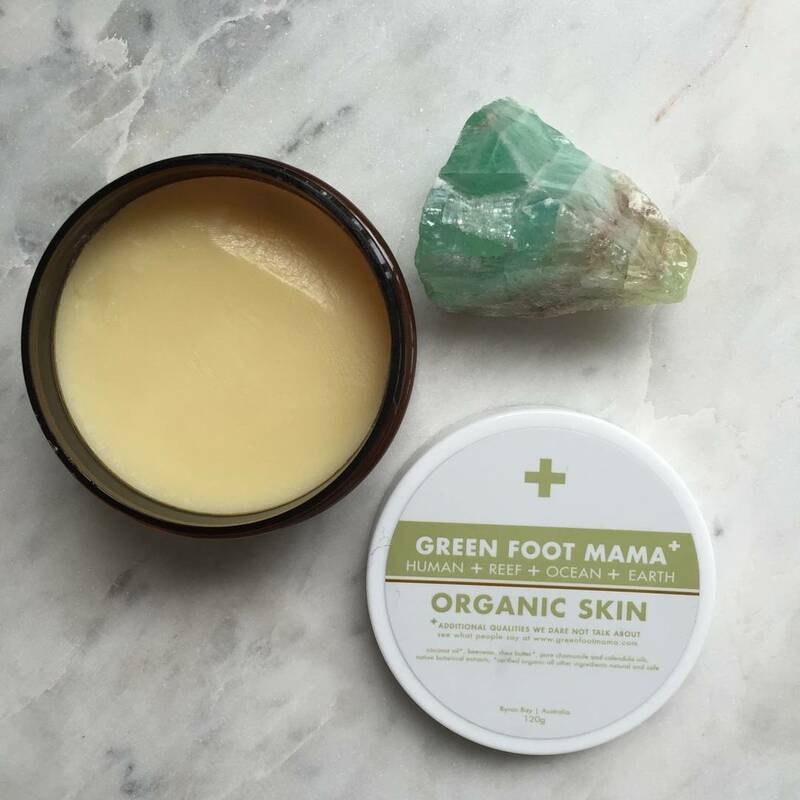 It’s half cream half amazing, not to mention… all natural!! 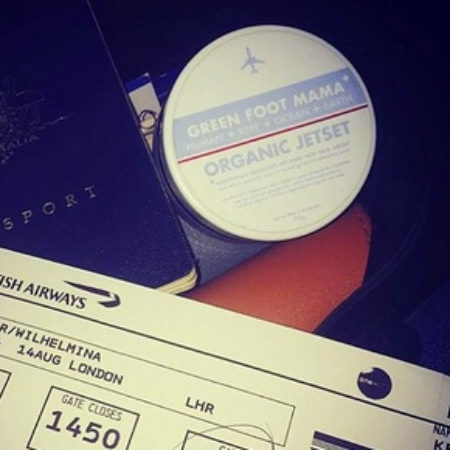 “I really liked the travel balm and found it worked on everything from my hands to hair!